a nice classic one...love the band to. I havent taken it appart yet as i have to make a few pictures for the Digital Watch Library, but i expect a clean movement and the alarm issue is probably easy solved. Tonight i swapped the movement to the 5010. The 5050 was equiped with new gaskets, which came in handy. The alarm is working fine. Personally i think the A259-5010 is one of the most elegant but sturdy LCD watches that Seiko made through the years, a true identification with the 1970's; the alarm-roster, the beautifull yellow and blue letters on the inner bezel, the movement. Basically the design of this particular Seiko LCD. I wrote this excample is near NOS. Maybe that was a little overdone as the watch has a small chip missing on the right side of the crystal, where it also has some marks on the metal bezel/case. Nevertheless, the crystal is near perfect, the alarm-roster is mint, the 'alarm chronograph' inlay is perfect and the case has minor signs of use. I have recently started to appreciate these Seiko LCD watches and consider myself lucky to have found them again. My college room mate wore one, and, at the time, I didn't think much of it. I never wore a watch -- not for not trying, but I never could find one that worked for me. Vintage watches were delicate and broke, stainless divers don't fit under sleeves and are heavy, plastic watches are um, plastic, and so on. I picked up an A359-5000 for my son for Christmas. It was NOS and I thought in the pictures it really looked great. When it arrived, I was doubly delighted with it. The construction, weight, design of it were really remarkable. What was particularly appealing was the design of the speaker grill -- a centered Seiko against bright steel and black paint. My son loved it, but wouldn't wear it as it was too nice to wear. So I decided to see what else there was out there (mostly ebay) and no more NOS watches. so I picked up a g757 and two a259s. My son got the G757 (what a fun and cool calibre -- too bad about the case not being SS) and my daughter got the a259-5070 (which she loves). So now, I decided I wanted one and picked up an a259-5010. 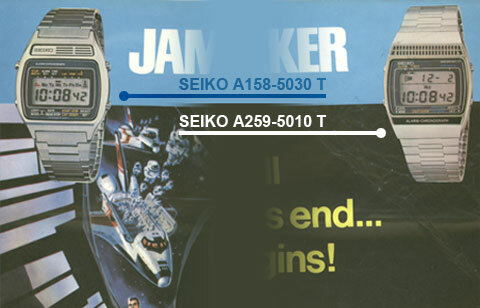 The Seiko speaker grills are the design element which really sets these watches apart from the generic lcd watches that followed. The 5010 with its bold grill and multi-colored print really is a unique watch. The bracelet is one of the best as it is a perfect extension of the case and very comfortable. Much to my luck, the watch came perfectly sized for me. I couldn't agree more, and thanks so much for posting pictures of this beautiful watch. The Seiko speaker grills are the design element which really sets these watches apart from the generic lcd watches that followed. The 5010 with its bold grill and multi-colored print really is a unique watch. First of all, wellcome to the forum! Thanks for the warm welcome. I don't mean to hijack this thread, but I thought some pictures would be nice to go along with my story. Also, I was able to find a cheap copy of the Seiko book, "a Journey in Time" which actually is a fun read as Seiko is a much more interesting company than I knew. They were real innovators! Just wish there were more details of the design aspects of the LCD watches. I didnt know this A259-5070 yet, i like it..
Wow, gorgeous picture and watch. I didn't know there was a blue variant and now I will have to look for one. The 259 and 359 series never cease to surprise and delight me. Interestingly, my picture the a259-5010 doesn't do it justice. It shows flaws that aren't that aren't apparent in everyday use. Your photography, on the other hand, captures the character of the watch much, much better. Thanks for the compliment, I enjoy watch photography. I put them on my Flickr account for other watch enthousiasts (sometimes its so hard to find reasonable pictures of watches.. so i like to contribute on that part) and i use them for my Ebay listings, forums etc. I fabricated a 'lightbox' out of a cardboard box. I put three daylight-lights around it (top and sides. dayligth lighting captures the true colours better). Then off course a reasonable good camera and a tripod. These days (in contrast to the picture below) i use a black background for better contrast. I recommend everybody to give it a try. Its fun and rewarding. Me being a seiko fan, i'm pleased to see these beautiful watches guys. Thanks for the photo tip seicitizitch, i think i'm going to make a similar setup as well. Where to start? I have a Seiko A259-5010 which I bought in new 1979 and have been wearing since: 38 years. It has seen me through a lot of rough road, and never failed me. At the time I bought it, it was cutting-edge technology and much admired. I've always loved the build and design, the layout of the displays, the speaker grill, etc. and the intuitive way it functions. Other watches came and went, but the Seiko has been the tried and true favorite. Recently, however, the display has stated to fragment. I sent it off to Seiko in Mahweh, NJ, and they wanted $170 to clean and refurbish it with no guarantee that it would be fixed. I gathered from your forum that the most likely problem is with the zebra strips. I don't have watch tools or a magnifying glass lamp, and although I'm handy I've never attempted such a small repair before, so before diving in the deep end and drowning I thought I'd ask for some advice on this. Is this something I should even think about attempting to start with, and if I could, how would you recommend I begin? Many thanks for any input on this. Thank you for your welcome. I will try to post pictures of the display. I described it as fragmenting, meaning there are parts of numbers missing from the month/date display. The time display seems to be holding up okay for the hours/minutes, but the seconds are fragmented as well, with parts of those numbers missing. Did something went wrong the last time you changed the battery? missing segments means i leakage of the battery or someone pulled the module a little bit apart. you could try to open it and tacle the problem but its not easy. you could first try to pinche the module together to see that the missing segment light up. But be careful not to damage the lcd...just a light push to see if its better.